Named after the only children’s book acclaimed Southern author Eudora Welty ever wrote, Mississippi based indie pop/rock band, The Shoe Birds bring their second album Departures to an ever growing audience, following their critically acclaimed debut album Southern Gothic. Eudora Welty’s book has been compared to a modern day Aesop’s fable, with the moral of the story being “think for yourself” — which is the goal for the band’s founders, Scott Coopwood (guitars, background vocals) and Norman Adcox (lead vocals, guitars). Coopwood and Adcox worked hard to create music with its own sound and message that stays true to themes from the heart, telling stories influenced by growing up and living in the Mississippi Delta, Mississippi and Memphis. 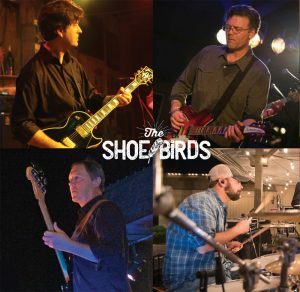 With Barry Bays (bass) and Brian Schilling (drums), The Shoe Birds have been developing a reputation for their hook filled tunes, influenced by the South’s rich culture and music, as well as its literary heritage. Departures, was produced by Coopwood. The new CD is comprised of nine songs that were mostly recorded in Coopwood’s studio in Cleveland, Miss. by Coopwood and famed engineer Mike Iacopelli whose credits include Aretha Franklin, George Clinton, Jennifer Holiday, Stevie Wonder, Keith Richards, the Red Hot Chili Peppers and many others. Coopwood and Adcox also returned to Sound Emporium in Nashville to record some of the record with Mike Stankiewicz (Kenny Chesney, Gavin Degraw, Linda Ortega, Willie Nelson) engineering. Portions of the record were also recorded at Ardent Recording Studios in Memphis with Mike Wilson who Coopwood has worked with on other projects for the past ten years. The Shoe Birds’ Departures promises to draw you in with their sound and leave you wanting more.